Complete an Interchange Modification Study (IMS) along I-71/75 including the three interchanges at KY 1017, KY 236 and I-275. The IMS should address the safety issues associated with the weaving condition along southbound I-71/75 between I-275 and KY 1017. The IMS should evaluate traffic volumes to determine a configuration that will provide sufficient capacity through the design horizon. Reconstruct the interchange as recommended in the IMS. This project will provide sufficient capacity for the significant volumes of traffic and freight that travel through this vital corridor daily. 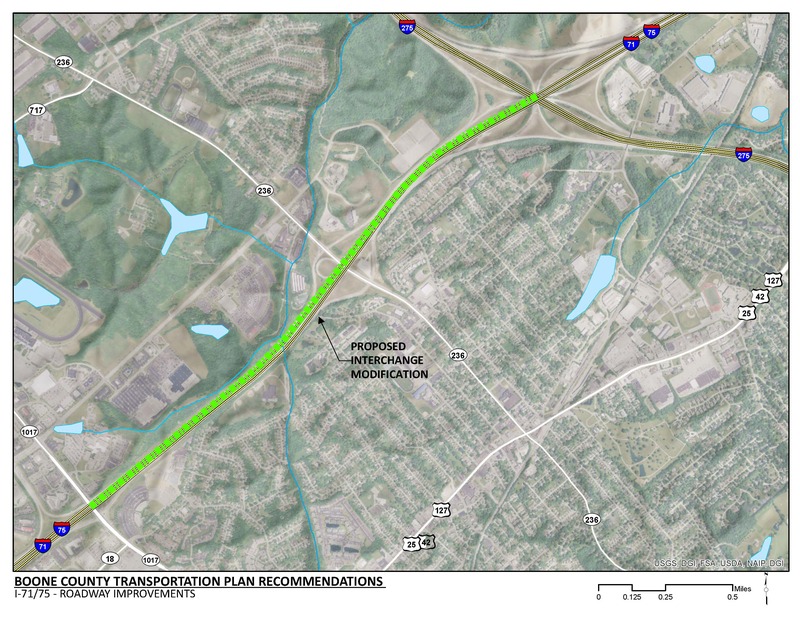 Improvements to this regional pinch-point will drastically improve travel time through Northern Kentucky. An improvement to this section of I-71/75 will reduce the frequency and severity of crashes on the interstate. The construction cost of this project will be significant. Additional funding sources or innovative finance may need to be evaluated to complete the construction of this important transportation improvement. The existing I-71/75 interstate through the I-275 systems interchange is a critical pinch-point along the I-71/75 section through Northern Kentucky. The entire length of I-71/75 in the OKI region is severely congested. Combined southbound and northbound traffic volumes on I-71/75 at the Brent Spence Bridge is 152,223 vehicles per day. I-71/75 is currently operating at a Level of Service “F” and is expected to continue to deteriorate through 2040, if no improvements are made. I-71/75 is part of a national corridor connecting Detroit to Miami. More importantly, it is the life blood of the OKI Region linking areas of huge employment density for the region including downtown Cincinnati, Covington, Florence, and Erlanger. The I-71/75 interchange with I-275 is a major system to system interchange that provides connectivity to the Cincinnati/Northern Kentucky International Airport (CVG). CVG’s active development and lease of airport property to companies such as DHL Express and Amazon Air Prime will continue to add employee and truck travel demand on I-275, I-71/75, KY 236, and KY 1017. The Boone County and Northern Kentucky Area Planning Commissions project commercial land use to increase around the I-71/75 interchanges with I-275 and KY 236 due to the redevelopment of the Erlanger Cinemas and Marydale properties. Boone County population growth is projected to increase to almost a quarter of a million people by 2040 which is highest in the Greater Cincinnati region and Commonwealth of Kentucky. The existing I-71/75 interchange at KY 236 is located within approximately 0.5 miles of I-275. This does not provide sufficient interchange spacing for safety merge/diverge conditions and contributes to crashes within the project area. The existing weaving area along southbound I-71/75 between KY 236 and KY 1017 does not comply with modern lane balance principals. As a result, vehicles much change lanes more frequently and increase exposure to possible crashes. TANK currently operates eight express routes in Boone County that operate along the I-71/75 corridor and are susceptible to delays caused by peak-period traffic congestion.